This high impact, full day seminar blends presentation, high engagement, and follow up telephone group coaching to provide a comprehensive learning experience. Through examples and interaction, you will deepen your understanding of introverted leaders. Who are well known examples? What do the statistics reveal about introverted leaders? What are their key characteristics and strengths? What are the challenges they face in today’s organizations? This well-tested, progressive four-step strategy is used by successful introverted leaders to build on their quiet strength and make it a source of great power. First, preparation: carefully devise a game plan for any potentially anxiety-provoking situation. Then, presence: knowing you’re prepared, be completely focused on the present moment. Then you can push—go beyond your comfort zone. And finally, practice, practice, practice—including networking, making presentations, and handling meetings. A newly revised quiz helps pinpoint where to amplify your quiet strengths and when to consider flexing your style. We will review responses from The Introverted Leader Quiz and help participants to focus in on areas of strength and improvement needs. 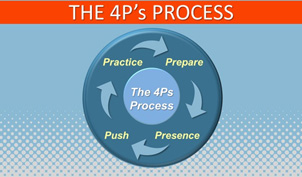 After that, we will apply the 4Ps process to challenging leadership scenarios like networking, making presentations, and handling meetings. Plenty of time will be provided to practice skills and gain confidence. We will also learn ways to create a more introvert-friendly team and workplace. We will review which tips and tools can make an immediate difference, and focus on putting those into action. The follow-up group coaching session (described below) will offer an opportunity to review progress and set new goals that are based on these plans. Telephone group coaching sessions take place 10-14 days after the class. Each group will have up to 4-5 class participants. We will focus on the specific progress made on your action plan. Gaps and improvement needs will be addressed through coaching from the facilitator and peers.